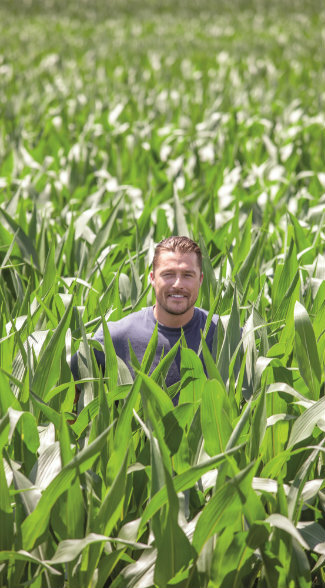 America’s most famous farmer is on a mission to educate his fellow Americans about this country’s greatest asset, farmland. In this Land Report exclusive, he describes his quest. If it weren’t for my sister Lori, no one outside of Iowa would know my name. I’d be just another farmer: up at dawn, out in the fields, driving a tractor that costs more than many a nice house. When lunch rolled around, Dad and I would head into Arlington, where I grew up, and grab a bite. We’d discuss how the markets were doing and run an errand or two for Mom. Then it would be back to work. Sound boring to you? Not to me. 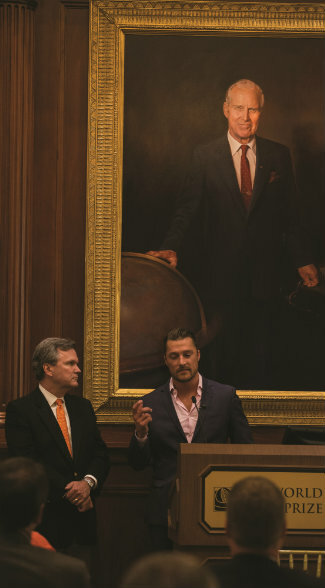 I’m proud to say that I grew up in the same corner of Iowa as Nobel Peace Prize winner Norman Borlaug, who is portrayed behind me in this beautiful oil at the World Food Prize Hall of Laureates. Mr. Borlaug is a hero to all of us in Iowa. Through his research, he was able to feed billions around the world. Standing beside me is Land Report Editor Eric O’Keefe, which is kind of appropriate. Eric thinks he is a Nobel Prize winner too. In fact, not to a lot of people here in the Midwest. The daily routine I just described is the rhythm of life for the folks I grew up with, including my friends from Iowa State. That’s where I went to college. A lot of us ended up on the family farm. All of us know someone who farms. You can’t help it — that’s Iowa. I’m a fourth-generation farmer. My father, mother, and I raise soybeans, corn, and hogs in Northeast Iowa. Most of my friends are either farmers or work in industries that support farming, selling seeds or heavy equipment, or providing some sort of financial service. I also work as a Land Investment Specialist with Peoples Company. We work with farmers and investors who are drawn to this asset class. We love farming. We love our work. We love the land. It may sound strange to some people, but one of my favorite parts about farming is late at night in the springtime or in the fall. Dad and I like to get in a truck and go watch the equipment run in the fields. All you can see is the lights, and the only sound you can hear is the hum of the turbos on the engines. I can’t explain it. To me, there’s nothing better than planting season and harvest time. To be able to watch a plant grow is a rewarding business. It’s very important to me to carry on the operation. I take a lot of pride in what we do. Hopefully, I can pass it on to the fifth generation of our family. By now I guess you can understand why my sister signed me up to be on The Bachelorette without even asking. She knows that I’ve got fertilizer on the brain. More importantly, she knows how much I enjoy doing what I do with our parents. For that matter, so did Andi Dorfman. Do you remember Andi? She was the bachelorette the season I was on the show. One day I was riding in a tractor and my cell phone rang. I saw the Los Angeles area code, thought it was a crank call, and ignored it. The next call was from Lori telling me to call that number back. Turns out I was being invited to audition for The Bachelorette. Growing up with three older sisters, l learned that life was far easier if you just did what you were told. So I called the producer right back. Next thing I knew, I was in Hollywood. Now I know how Dorothy felt in The Wizard of Oz: I wasn’t in Kansas anymore. That’s when I met Andi. She is such a great girl. She stole my heart … and then some. We had a great connection, but as viewers may recall, when I brought Andi back to small-town Iowa, it turned out her idea of heaven didn’t include row crops and grain silos. In this photograph, I’m discussing ag policy with Democratic political consultant James Carville at the Land Investment Expo in Des Moines. Actually, James is doing the discussing. All the discussing. I get it. Andi was being true to herself, and I will always respect her for that. She is who she is, and as viewers who watched me on The Bachelor and Dancing with the Stars know, I am who I am. I have fond memories of those experiences, but guess who’s back in Iowa? Me … at least part of the time. You see, thanks to my appearances on The Bachelor, The Bachelorette, Dancing with the Stars, and Food Network’s Worst Cooks in America, all sorts of people know who I am. More than a million people follow me on Facebook, Twitter, and Instagram. When I post a photo of sunrise over the fields, tens of thousands of people like it. One of the best things about all the time I’ve spent in Hollywood is that it gave me a platform to be an ambassador for agriculture. It’s a task that I accept. Agriculture definitely does need a voice. I’ve known that for a long time. 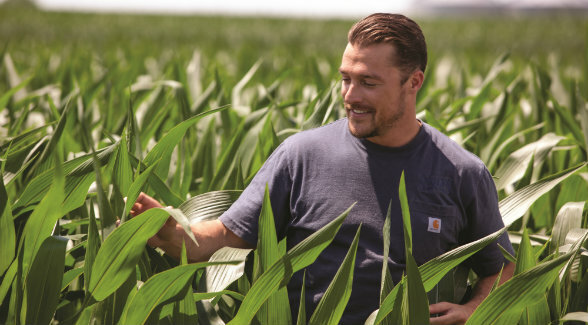 Farmers are good at talking to themselves about what we all do as farmers, but the truth is, farmers are pretty conservative and not that outspoken. My 15 minutes of fame is the first time any farmer has been given the opportunity to speak to a larger demographic, a national demographic. Believe me, it needs to be done. There’s a lot of misinformation out there. I’d like to help get the message out. Obviously, the podium I now enjoy is different from anything I ever thought I would have in my entire life. I’m a farm kid from Northeast Iowa. Opportunities like this don’t happen to someone like me. I’ve been truly blessed in everything I’ve experienced, which is why I decided that if there was anything I can do to give back to agriculture, I should take advantage of that opportunity and speak to a whole group of people who farmers really never have been able to connect with. Feeding the world has been very good to Iowa. Remember the Great Recession? Iowans don’t. While the rest of the country was drowning in toxic mortgages, the price of an acre of good farmland just kept on climbing up. In fact, since 2000, the best Iowa farmland has tripled in value. Because over the past decade, I’ve bought and sold more than $200 million in Iowa farmland assets for clients. During that time, I’ve had the privilege of working for some of the very best in the business, including Randy Hertz at Hertz Farm Management and Bruce Rastetter at Summit Agricultural Group. What a great way to build on my background at our farm and my double major in agricultural studies and agronomy from ISU. I love being an advocate for farming. Can you tell? Today, I’m a Land Investment Specialist with Peoples Company, which started as the farm management department of Peoples Trust and Savings Bank in Indianola and is now a leader in land brokerage, management, investment, and appraisal services throughout the Midwest. 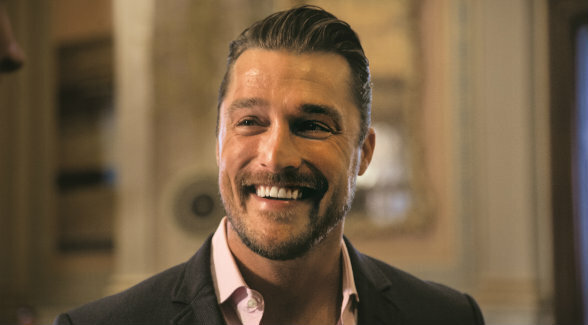 The story of how I hooked up with Peoples is a perfect example of the strange twists and turns my life has been taking since Lori got me on The Bachelorette. Next February marks the tenth anniversary of the Land Investment Expo. It’s an event that the Peoples Company hosts in Des Moines in the dead of winter. Everyone who has ties to farming is there. The first reason is because Steve Bruere and Peoples Company put on a great event. The second reason is because all the farmland in the Midwest is frozen solid. Boone Pickens has been a keynote speaker. So have James Carville and Mary Matalin. A couple of years ago, it was Donald Trump’s turn. He wasn’t running for president then. He was just being Donald Trump, which is an event in itself. I had just finished being on The Bachelor, and before I knew it, we were introduced. Donald asked me a few questions about my background, and when he gathered that I had a lot of experience in ag investing, he turned to Steve. “You should hire this guy,” Donald said. Coming from someone who has fired as many people as Donald has, I considered it high praise. On top of that, I’ve watched Steve grow his company from a small local firm to a major player in the farmland industry. In fact, I began my brokerage career at Total Realty, which is now a part of Peoples. I like the culture of the company and the way they conduct business. A couple of months later, Steve and I struck a deal for me to sign on with Peoples. It’s been a perfect fit. On the one hand, I’m sharing the message of American agriculture with millions of consumers via social media and at promotional appearances around the country. And now, with Peoples Company, I’m able to help investors find the right deal with a product that I’ve devoted my entire life to. That’s right: my entire life. When I was 7, Dad would hop up in a tractor and put me in his lap. My feet were too short to reach the clutch or the brake, so the steering wheel was my job. In the years that followed, Dad not only taught me how to run every piece of machinery on our farm, but he also made sure I understood the basics of buying and selling farmland. Not many high school kids know that you make your money on the buy side, not the sell side. Or that the best investment is land no one else wants. But I did. Buy right and you can add more value less expensively. Today, if I can’t make a 10 percent profit on a piece of Iowa farmland the day after we close, I know I didn’t buy it right. And those skills are going to be put to the test — soon. The current market capitalization of Iowa cropland is well over $200 billion. That’s a big number, right? Actually, the more important number is the percentage of that cropland that is about to change hands over the next decade: more than 50 percent. That’s well over $100 billion of some of the world’s best dirt. When I tell you farming is in my blood, I mean it. 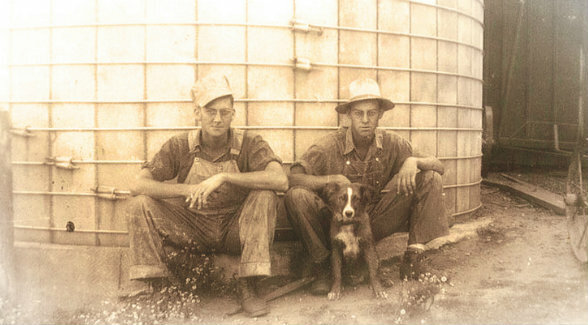 That’s my grandfather, Warren Soules, on the left, and his brother Richard on our family farm. Thirty percent of Iowa cropland owners are 75 or older, and another 26 percent are in the 65–74 age bracket. A lot of this land will go into trusts. Some will be given or willed or sold to a relative. But according to the USDA, a significant percentage of the farms I just mentioned will be sold to nonrelatives, and that’s where the opportunity lies. Over the next decade, there’s going to be a gold rush in the Hawkeye State, and my family is already in the middle of it. Over the past two decades, my parents and I have grown our farm from 1,500 acres to more than 5,500 acres. We’ve also expanded our hog facilities to four buildings. And I promise you there’s still a lot of opportunity to grow. I call that putting your money where America’s mouth is. Another thing I bring to the table are the contacts I’ve made in the entertainment industry and pro sports. These guys have no idea about the returns farmland can generate. For that matter, neither do most Americans. Dad and I certainly do. More than a decade ago, we spent a considerable amount of time and money developing a farming operation in the Ukraine. The rich, black soil was unbelievable: five feet deep. But the country was communist in everything but name. No one had any work ethic, and everyone drank too much vodka. Infrastructure? None at all. I’m talking about the basics – things like electricity and irrigation. Farm equipment was so scarce over there that we shipped our own tractors from Iowa. So we took our oldest Massey Ferguson 750s — well-maintained combines that we had used forever — broke them down, crated them up, and freighted them all the way to the Ukraine, where we had them reassembled. Although I was only in my twenties, I learned a valuable lesson: There’s no better place to farm than in America. We’ve got so much great land, top-notch researchers, excellent infrastructure, and the world’s best export system. We all have our beefs about Washington — this is an election year, right? — but I can assure you that our government provides a level of stability that is second to none. That’s why I’m so optimistic about investing in land. Have been all my life.